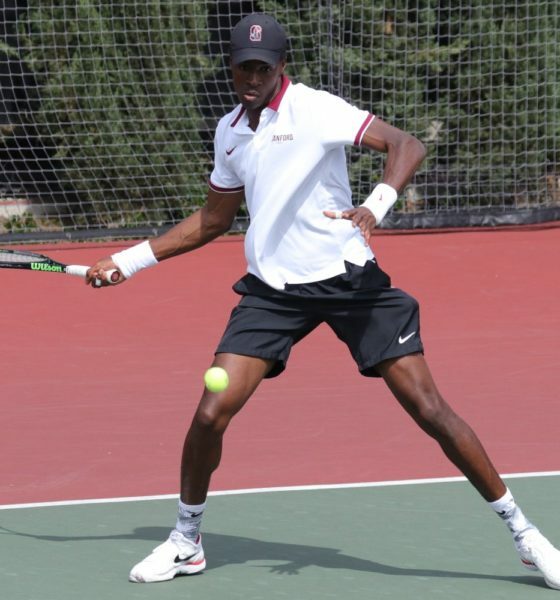 LOS ANGELES – Graduate student Eric Fomba provided his second clincher in Stanford’s four Pac-12 matches, as the Cardinal rebounded from a doubles defeat with four wins in singles to down No. 14 USC, 4-2, Saturday afternoon at Marks Stadium. Stanford erased a 2-0 deficit with four consecutive wins and was on the doorstep of a fifth as David Wilczynski had match point when Fomba clinched it. Fomba, who also clinched a 4-3 victory at No. 20 Arizona State earlier this month, recorded his third clincher of the season All three have come against top-20 opponents as the graduate student also lifted the Cardinal to the win over No. 12 Baylor in the ITA National Indoor Championships. The win improved the Cardinal to 16-2 overall, matching its best start in 16 seasons. It’s Stanford’s first win in Los Angeles against either USC or UCLA since 2010 and the Cardinal’s first win against the Trojans in Los Angeles since 2009. Stanford is now 3-1 in Pac-12. USC moves to 12-6 overall and 3-1 in the conference. The Trojans struck first, securing the doubles point in a battle that went to a tiebreaker. Stanford and USC traded wins at No. 1 and No. 2, with Tom Fawcett and Axel Geller getting the win for the Cardinal. USC’s Daniel Cukierman and Tanner Smith sealed the point at No. 3, with a 10-8 win in the tiebreaker. A win at No. 6 singles put the Trojans up, 2-0, before Stanford seized momentum in the match. Geller got it started with a straight-set win at No. 2 and Sameer Kumar followed moments later with a straight-set victory at No. 3. In a top-10 matchup, Fawcett, ranked No. 10, and No. 9 Brandon Holt of USC staged a three-set battle. The Cardinal senior rebounded from an opening-set defeat with a pair of 6-3 frames to win it and push Stanford ahead for the first time in the match. All eyes went to the No. 4 and No. 5 matches. Fomba (No. 4) and Wilczynski (No. 5) both dropped the first set of their matches, but each stormed back with second-set wins. They continued their momentum with multiple-game leads in the third set. Fomba sealed it first with the 6-2 victory in the third set. Wilczynski was up 5-1 in the third set with match point coming up when Fomba clinched it. The win for the Cardinal was its second over USC this season. Stanford defeated the Trojans, 6-1, in February on The Farm. Stanford returns to action next Saturday (April 7), hosting No. 39 Utah at 1 p.m. PT at Taube Tennis Stadium. LOS ANGELES – The No. 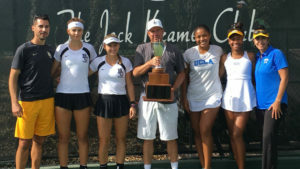 5 UCLA women’s tennis team fell to No. 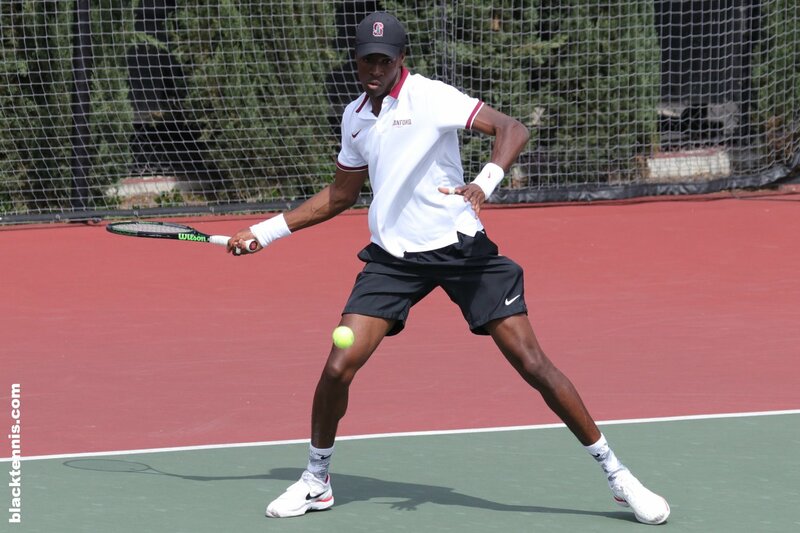 32 USC 4-1 in a non-conference match Friday at Los Angeles Tennis Center. USC got on the board first, winning a close doubles competition. Jada Hartmomentarily pulled the Bruins (7-2) even with a dominant performance on the top court, but the Trojans (6-2) eventually prevailed with three singles victories. 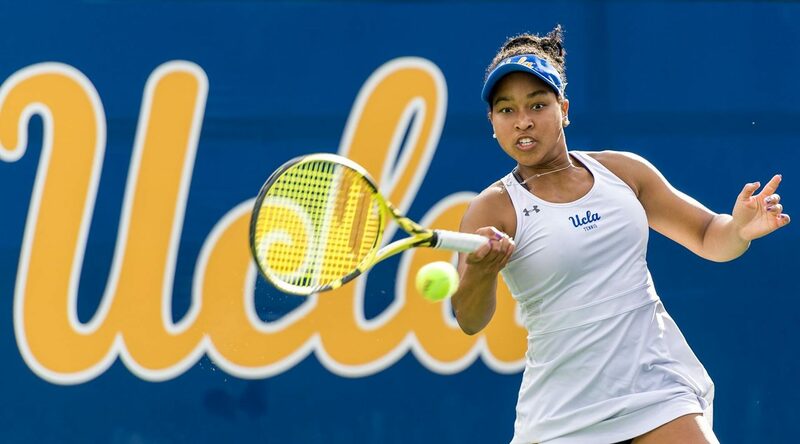 The 14th-ranked UCLA pair of Elysia Bolton and Jada Hart went up a break on Becca Weissmann and Danielle Willson at 4-2 on Court 2 and used that on the way to a 6-4 decision and the first win of the day. Bolton-Hart improved to 16-5 on the year with the win. The Trojans pulled even on Court 3, where their pair of Constance Branstine and Estella Jaeger jumped out to a 4-1 lead over No. 38 Abi Altick and Alaina Miller. The UCLA pair countered with a break and found itself down 3-4, but Branstine and Jaeger took the final two games. That left it up to the top court, where the UCLA combination of Gabby Andrews and Ayan Broomfield picked up an early break for a 3-1 lead. Angela Kulikov and Rianna Valdes answered with four straight games, though, for a 5-3 advantage. A late break by the Bruin pair could not turn it back around, as Kulikov-Valdes gave USC the day’s first point. The Trojans carried their momentum into singles play, where they tallied four first-set wins. Hart did her part with a commanding performance on the top court. Playing against No. 34 Salma Ewing, the redshirt junior cruised to a 6-0 first set. Ewing took the first two games of the second set, but that did not faze Hart. The Bruin won the next six games and the match to tie the overall score at 1-1. Hart improved to 2-1 on the dual-match season, with each of her wins coming against top-45 players. No. 120 Weissmann put Miller behind the eight ball with a 6-0 first set on Court 5. The Bruin recovered with two of the first three games in the second set, but Weissmann worked her way back to a 6-4 win and the Trojans’ second point of the day. On Court 3, No. 112 Broomfield took two of the first three games before Valdes answered with five of the next six to earn the early edge. The Trojan never trailed in the second set, posting mirror-image 6-3 performances to extend the lead to 3-1. The overall result was ultimately decided on Court 2, where Kulikov topped No. 11 Bolton with a 6-3 first set. UCLA’s freshman charged into the second set with a 4-1 lead, but Kulikov fought back for a 7-5 victory to clinch the match. The Bruins will open Pac-12 play Friday, March 8 with a visit to Arizona State. First serve from Whiteman Tennis Center will occur at 12:30 p.m., PT. SURPRISE, Ariz. – The UCLA women’s tennis team will officially mark the end of the 2018 portion of its schedule at the Oracle ITA National Fall Championships this week, when it sends five players to the Surprise Tennis & Racquet Complex. The five-day event will conclude Sunday, Nov. 11, with ESPN3 and the ESPN App providing live coverage of the singles finals. Seven Top-10 singles players from the Oracle/ITA preseason list and five Top-10 doubles tandems are in the star-studded field. UCLA will be represented by two singles players and two doubles teams. It was recently announced that the Fall Championships singles winners will be granted main-draw wildcard spots in the 2019 Oracle Challenger Series tournament. More information is available HERE. 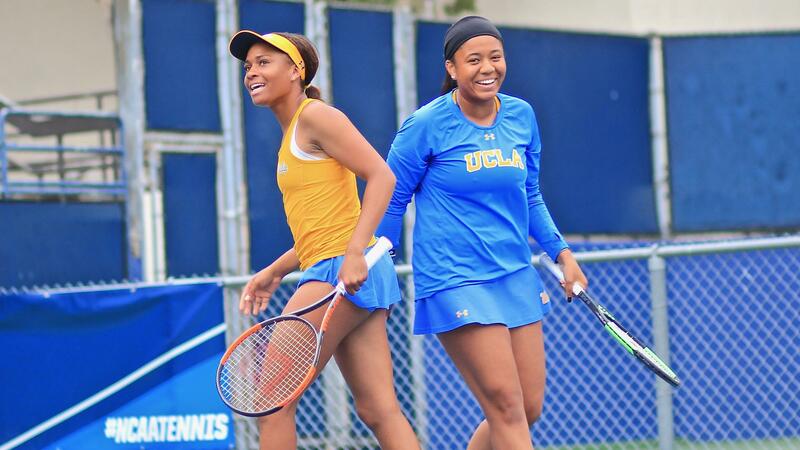 Heading up the Bruin contingency is the red-hot doubles duo of Gabby Andrews and Ayan Broomfield, which has now claimed back-to-back titles after topping the Jack Kramer Collegiate Tournament field. Previously, the pair won the ITA Southwest Regional Championships doubles title to earn an automatic bid in this week’s draw. For the year, Andrews-Broomfield holds an unblemished mark at 8-0. Seeded sixth, the pair will face off with Air Force’s TJ Fumagalli-Kristin Kerrigan Wednesday. Earning an at-large doubles bid, meanwhile, was the 29th-ranked combination of Elysia Bolton and Jada Hart. The pair, which turned in strong performances at the Riviera/ITA All-American Championships and ITA Regionals, currently sits at 7-2 on the year. Bolton-Hart is staring down top-seeded and third-ranked Michaela Gordon and Emily Arbuthnott of Stanford in the first round. Bolton, who is No. 3 among freshmen according to Oracle/ITA, also picked up an at-large berth in the singles draw. Seeded 13th, Bolton will face Princeton’s Stephanie Schrage in opening-round play. 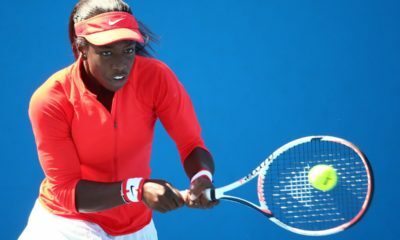 If victorious, Bolton could take on 2017 NCAA singles champion Brienne Minor of Michigan in the second round and past Oracle ITA Masters foe No. 3 Estela Perez-Somarriba of Miami in the Round of 16. Bolton is 7-3 across three highly-regarded tournaments this fall. Joining Bolton in the singles draw is sophomore teammate Abi Altick, who also picked up an at-large nod. No. 52 Altick will take on No. 20 Marianna Petrei of Idaho in search of her sixth win of the fall. Two of Altick’s five triumphs thus far have come over ranked opponents (No. 53 Sabina Machalova of Ole Miss, No. 51 Petra Melounova of Hawai’i). 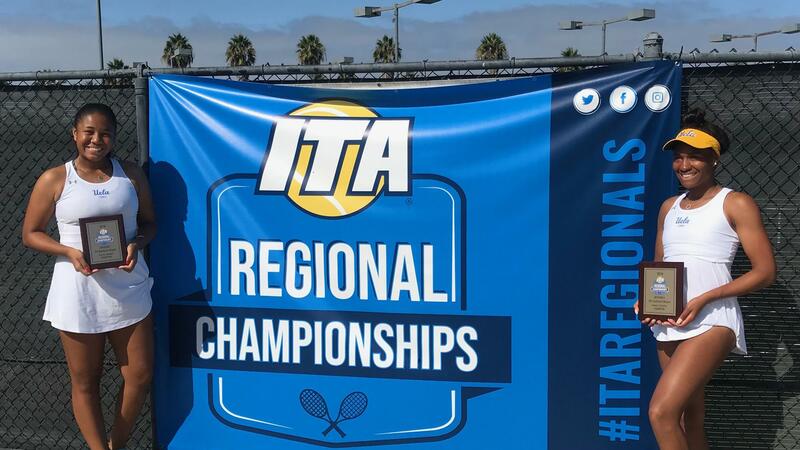 SAN DIEGO – The UCLA women’s tennis doubles duo of Ayan Broomfield and Gabby Andrews fought back Monday to take the ITA Southwest Regional Championships doubles title and claim a spot in November’s Fall Championships. The pair defeated Ashley Lahey and Evgeniya Levashova of Pepperdine, 1-6, 6-4, 1-0 (8), in a thrilling final. It was a successful trip South for the Bruins, who had three teams reach the doubles semifinals and three singles quarterfinalists. Each of the seven Bruins in action tallied at least one singles win over the five-day event. The doubles title marked a repeat performance for Andrews, who teamed with Jada Hart to win last year. Andrews-Broomfield was fast out of the gate, defeating duos from Grand Canyon and San Diego State by 8-0 and 8-3 scores, respectively. The quarterfinal round marked the pair’s first match against a Pac-12 foe in crosstown rivals Angela Kulikov and Rianna Valdes of USC. Andrews-Broomfield would keep rolling, earning a spot in the semifinals with an 8-3 victory and setting up a showdown with teammates Abi Altick and Alaina Miller. 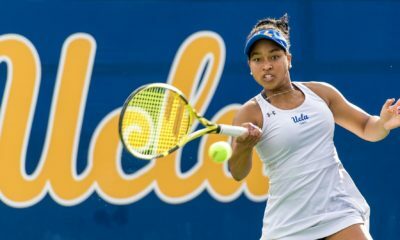 Altick-Miller had defeated a pair of San Diego-area teams before notching an impressive quarterfinal-round win over Pepperdine’s Jessica Failla-Anastasia Iamachkine, 8-2. The all-Bruin semifinal, which was a best-of-three-sets affair, needed a tiebreak in the first. Andrews-Broomfield edged its counterpart and then doubled up Altick-Miller in the second for a 7-6, 6-3 win. On the other side, 29th-ranked Elysia Bolton-Jada Hart cruised into the semis with three 8-3 wins. There, the freshman-junior combination was edged in a close one, 7-6, 6-4, by No. 26 Lahey-Levashova. The Pepperdine pair looked destined for the title with a 6-1 first-set win over Andrews-Broomfield. The Bruins charged back, though, forcing a tiebreaking first-to-10 third set. The back-and-forth final set ultimately went to the Bruins. The 1-6, 6-4, 1-0 (8) victory sends Andrews-Broomfield to Surprise, Ariz. for the Oracle ITA National Fall Championships, to be played Nov. 7-11. In singles, six Bruins made the Round of 32, while five reached the Round of 16. No. 86 Miller had two hard-fought wins to reach that round, while fellow senior Broomfield took it a step further by defeating No. 104 Dzina Milovanovic of Pepperdine, 7-6, 6-3, in the quarterfinals. Broomfield’s win avenged Andrews’ loss to Milovanovic one round earlier. No. 15 Jada Hart beat Jenny Moinard of San Diego State, 6-3, 7-6, before watching her journey end versus Pepperdine’s Jessica Failla in three sets. Underclassmen Abi Altick and Elysia Bolton had standout performances, as both reached the semifinals. Each notched a big win in the quarters, as No. 52 Altick defeated No. 51 Petra Melounova of Hawai’i (6-3, 7-6) and Bolton ousted No. 41 Levashova (6-1, 4-6, 6-2). Freshman Katie LaFrance recorded the first win of her Bruin career, 6-1, 6-3 over Autum Prudhomme of Grand Canyon in an extra match. For full results from the tournament, click here. 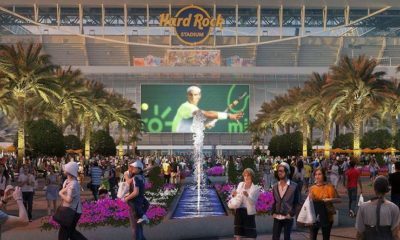 Can Venus take the BNP Open title?